If you thought the prices of iPhones couldn’t get any lower, be prepared for shock and amazement. 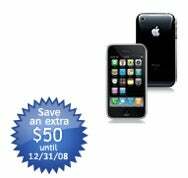 Earlier this month, we reported that AT&T was offering refurbished iPhones for the low, low price of around $50 off. That price has now sunk even lower, making AT&T start to look like Crazy Bob’s Used iPhones and Automobiles. A refurbished 8GB model now goes for just $99 with a two-year contract—another $50 off the $150 price they were offering just a scant week ago. Of course, the specter of fine print hanging over the deal says that you’ve only got until December 31st—a mere 48 hours hence—to take advantage of the special offer. But just in case there’s somebody in the family who didn’t get that iPhone they wanted for Christmas, whether it be crotchety Uncle Charlie or your pet dog Mr. Fluffles, you can fill that gap. Well, of course, as long as Mr. Fluffles can handle the monthly service charges.